On the back side of that dog-earred copy of minutes typed by secretary-sculptor, Ruth Vodicka, a roster of dues payers rings out like a sculptor’s who’s who, now both famous and obscure. Calvin Albert, Jason Seley, George Sugarman, Ruth Vodicka, Israel Levitan, Rhys Caparn and Mary Frank wrote checks for $5. Richard Stankiewicz, Herbert Kallem, Anne Arnold, Sidney Geist, Blanche Phillips, Abram Schlemowitz, Waldemar Baranowski, Jean Follett, John Chamberlain and William King contributed cash. Expenditures included $25 for printing, 92 cents for labels, $29 for stamps and $18 for refreshments. The first New Sculpture Group show was in the works. The group did not just pop up out of the blue. The first tremors were recorded in late 1955 at the now famed Tanager Gallery on East 10th Street with “Sculpture 1955.” Galleries like the Hansa, Alan, Egan, Artists, Peridot, Bertha Schaefer. Grace Borgenicht, Willard, Contemporary Arts and Kootz were represented. Going over the 24 names, certain ones stand out such as Giorgio Spaventa, David Hare, Louise Bourgeois, Marisol Escobar and David Smith. Others draw question marks. In light of Reuben Kadish’s remark, “Being in a Tanager show was a point of achievement among the sculptors,” one wonders what happened to the then familiar names Blanche Dombek, Fred Farr and Raymond Rocklin? Thirty years after the New Sculpture Group’s debut at the Hansa Gallery at 210 Central Park South, a handful of the original group were contacted and memories played back another kind of minutes. “We weren’t really an organized group,” recalled Abram Schlemowitz. “It has a place in history but from the beginning we agreed that if it lost its usefulness we’d dissolve and it did…it just died out. “Sculptors were hard put to make noise then because the noise was paint noise,” opined art dealer, Virginia Zabriskie, who opened her gallery in 1955. It is difficult to get a feel for that time without context and it is hard to beat the New York Times’ booming headline on Wednesday, September 25, 1957 (the day following the first New Sculpture Group opening): “President Sends Troops to Little Rock, Federalizes Arkansas National Guard; Tells Nation He Acted To Avoid Anarchy.” The president, of course, was Dwight D. Eisenhower and the front page photo showed troops from the 101st Airborn Division positioned outside Central High School in Little Rock, armed with carbines and billy clubs to insure compliance of a courtordered integration plan involving nine black students. Internationally, French paratroopers seized a 29 year old rebel chief in Algiers while on the local scene, the Board of Estimate approved a $24 million parking garage project for midtown. By the end of the New Sculpture Group’s three week exhibition, the Soviets fired Sputnik into space, James Hoffa was elected Teamsters head and an Asian influenza outbreak kept 200,000 New York City pupils out of school. Down in troublesome Little Rock, Governor Orval Faubus compared his racist stand to Lee’s. What is the point of bringing back sculpture (or even headlines) from that time? Simply put, The New Sculpture Group butted its head stubbornly against the New York art world and made some noise in the process. Some critics and collectors took notice and a number of once obscure sculptors emerged on the scene, Many of these front-line troops suffered and remain “underknowns,” a term recently minted by Henry Geldzahler. Today, because of the group’s activist stance that triggered critical turbulence in the art magazines and homesteaded a place for the work beyond the small artist co-op galleries, American sculpture is a legitimate force in the contemporary arena and if anything, painting must share its crown. These sculptors-representing a vast range of styles, temperaments and material preference–banded together and created an assemblage of differences. Carved wood, foundry resurrected junk, welded steel, terra-cotta, cast bronze, painted wood, ghost white plaster and any number of two-dimensional reliefs became part of this new, fragmentary voice. It was both abstract and figurative, surrealistic and jazzy, humorous and piercingly earnest. In many ways it reflected a comment made by Richard Stankiewicz to collector-interviewer, Richard Brown Baker in 1963 for The Archives of American Art: “…I make sculpture according to my ability to see and to construct, and the work will be as profound or as shallow as I am.” It was a brief movement, lacking in both hype and slickness. It was not neo-anything. Success scattered The New Sculpture Group and with it, the demise of artist-organized shows. No one took a vote but the collective spirit expired, Reflective of that change, the Tanager closed in June, 1962. 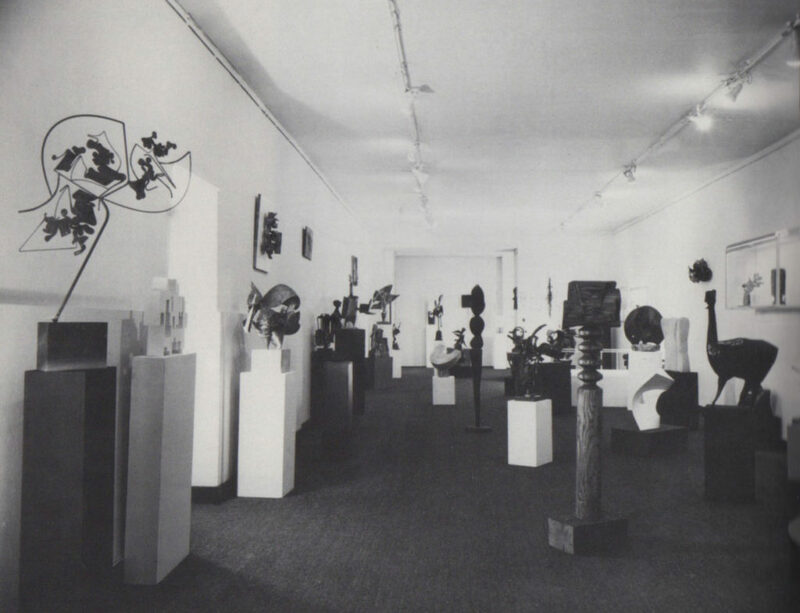 Under a different banner, “Sculptors Choice” in December, 1963 held at the East Hampton Gallery on West 56th Street, was the group’s last gasp. None of the participating artists contacted could point a finger to a particular episode, issue or personality that scuttled the group. Politics was mentioned-there was too much of it-or that too many women had joined the group, making some of the men uncomfortable. Thirty years is a long time to hold undocumented memories. For now, it is enough to re-stage some of the work from that time in a place that was the first home of the Whitney Museum of American Art. When the building took on another guise in 1964, Agostini, Bourgeois, Geist, Hare, Ladish, Lassaw, Pavia and Spaventa became part of the revolving Studio School faculty. The context, like Ornette Coleman’s evasive chords, resonates with 8th Street history. The Artists Club, Stanley Hayter’s Atelier 17, Hans Hofmann’s School of Fine Art, Club 35 and the old Cedar Tavern shared the same street. Those places don’t exist anymore but this look at the New Sculpture Group can serve as a beacon for new things to come.